The training of neurosurgical students is limited to plastic models, animals, cadavers or real patients under careful supervision. All these methods are both very expensive and need long preparations without the possibility to be reproduced. The lack of training possibilities has become a huge problem for neurosurgical education institutions, and with the emerging endovascular treatments, the need is growing. 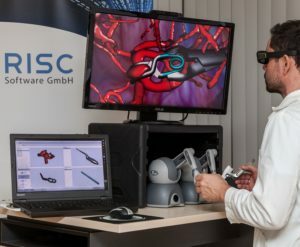 Innovation: RISC Software, EARTO member through UAR, created Virtual Aneurysm, a virtual simulator that enables repeatable trainings of the neurosurgical procedure to treat aneurysms for young neurosurgeons. It includes aneurysm models based on real patient data, as well as a library of 50 different neurosurgical clips and real surgical instruments allowing realistic interaction with the different virtual tissues. The trainee can repeat the complete procedure as often as necessary and at different difficulty levels to reach the required skills. Impact Expected: The market for medical simulators is growing worldwide and interest in these new technologies for education and operational planning is increasing. Virtual Aneurysm has been sublicensed to a worldwide distributor for commercial distribution and a professional simulator is under development. UAR is an Austrian Association of RTOs promoting innovative solutions at the crossroads where fundamental research meets applied research and offering businesses access to high quality R&D.